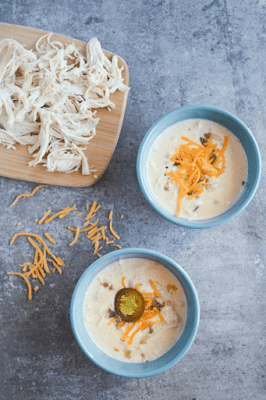 This Keto Jalapeno Popper Soup will soon become your family’s favorite low carb comfort food. It’s packed with savory flavor and just the right amount of kick. Make it on the stove-top, in the slow cooker or in your pressure cooker for an easy dinner for the cold Winter months. Be sure to make at least a double batch for leftovers! In skillet, fry bacon. When cooked, crumble and set aside. While bacon is cooking, place large pot over medium heat. Add butter and onion and saute until onion is translucent. Add jalapenos and half bacon crumbles to pot. Pour in chicken broth and shredded chicken. Bring to boil then reduce to simmer for 20 minutes. In small bowl, place cream cheese and put in microwave for about 20 seconds until warm. Stir until soft. Whisk cream cheese into soup and add heavy cream. It may take a couple minutes to fully integrate cream cheese. Turn off heat. Add shredded cheese and stir until fully melted. If thicker soup is desired, add xanthan gum at this point. Serve topped with remaining bacon. Instant Pot: Fry bacon in skillet on stove top or press “Saute” and then adjust heat to “less” Cook bacon until fat begins to render then press cancel. Press “saute” button and press adjust button to change heat level to normal and finish crisping bacon. Crumble and set aside. While still on saute mode, add butter, onion and sliced jalapeno to Instant Pot. Saute for 2-3 minutes then press cancel button. Add half crumbled bacon, broth, cooked shredded chicken, cream cheese broken in pieces, and seasoning. Click lid closed and set vent to sealing. Press soup button and adjust time for 10 minutes. When timer beeps, quick release pressure and stir in heavy cream and cheddar. Continue stirring until cheese is fully melted. For Slow Cooker: Place cooked bacon, along with all remaining ingredients except heavy cream and cheddar into crock pot. Cook on low for 4 hours. When ready to serve, add cream, cheddar and xanthan gum if desired. Please note that nutrition information will change based on your particular brands. Store brands vs. name brands are often different especially on heavy whipping cream and cheese so please be aware of this. I used rotisserie chicken but any pre-cooked chicken will work.